Bryan Adams, (born Bryan Guy Adams, 5 November 1959) is a Canadian rock singer-songwriter, guitarist, bassist, producer, and photographer. Adams has won dozens of awards and nominations, including 20 Juno Awards among 56 nominations. He has also had 15 Grammy Award nominations including a win for Best Song Written Specifically for a Motion Picture or Television in 1992. He has also won MTV, ASCAP, and American Music awards. In addition, he has won two Ivor Novello Awards for song composition and has been nominated for several Golden Globe Awards and three times for Academy Awards for his songwriting for films. Adams was inducted into the Hollywood Walk of Fame, with the 2,435th star in March 2011 and Canada's Walk of Fame in 1998, and in April 2006 he was inducted into the Canadian Music Hall of Fame at Canada's Juno Awards. In 2008, Bryan was ranked 38 on the list of All-Time top artists by the Billboard Hot 100 50th Anniversary Charts. On 13 January 2010, he received the Allan Waters Humanitarian Award for his part in numerous charitable concerts and campaigns during his career, and on 1 May 2010 was given the Governor General's Performing Arts Award for his 30 years of contributions to the arts. 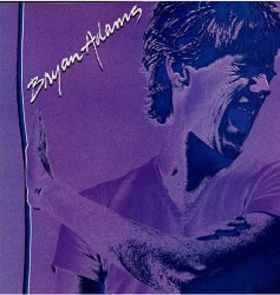 Bryan Adams was the self-titled debut solo album by Canadian rock singer Bryan Adams released in February 1980 on A&M Records. While the album did not gain attention in the US, "Hidin' From Love" reached #64 and "Give Me Your Love" reached #91 both on Canada's RPM 100 Singles chart. In early 1978, Bryan Adams teamed up with Jim Vallance (formerly of Canadian band Prism) to form a song-writing duo. A&M signed the pair as songwriters and A&M signed him as an artist shortly afterwards. He worked on his debut album for the balance of 1979 with it being released in February 1980. The first single was "Hidin' from Love" in 1980 (#43 on the Billboard dance charts) which was followed up by "Give Me Your Love" and "Remember". Although the album never received any US notoriety on its debut, it was the door opener that led to getting radio play, tours, management, agents and the music business in general, interested in the 20 year old songwriter. The first tour was across Canada playing clubs and colleges. It was during this time that Adams developed the songs for the US breakthrough album You Want It You Got It (1981).